Immigration-DHS funding: Senate, House Republicans at odds over how to fund the Department of Homeland Security. 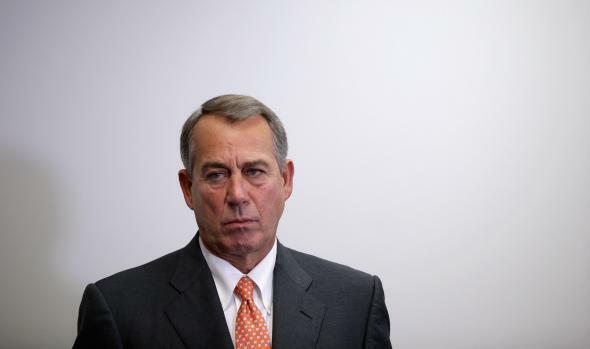 Speaker John Boehner hasn’t said whether he’ll have the House vote on the Senate’s DHS bill. Tick-tock. House and Senate Republicans remain at odds over how to keep the Department of Homeland Security funded without dropping their bid to block President Obama’s immigration reforms. They’re running out of time to find a solution—the department’s current funding is set to expire at midnight Friday. House Republicans have so far refused to budge from their preferred strategy, which is to tie the department’s funding to legislation that would block the high-profile executive actions that Obama announced last fall. Senate Republicans don’t have the votes they need to break a Democratic filibuster and send that bill to the president’s desk (where it would face a certain veto). After trying and failing to pass the House bill four times, Senate Majority Leader Mitch McConnell finally relented this week. On Wednesday the upper chamber voted, 98–2, to move forward on plan to fund the department for the remainder of the fiscal year. The so-called clean funding bill included no immigration-blocking strings. If all goes as planned, the Senate could sign off on the bill as soon as Thursday. Members are leaving the door open [to the Senate bill], so there’s a real possibility that they will vote for a DHS extension without immigration riders — a good sign for GOP leadership. But is it enough? Of course, even if Republicans ultimately cave, that still could happen after Friday’s deadline. Boehner will need at least 25 Republicans to cross the aisle and vote with Democrats to pass a clean bill—and he’ll no doubt want to wrangle a good deal more than that if he can. To make that happen, he may need to let DHS funding expire for a few days to show conservatives that he took the fight as far as he could. Up until this week, the DHS stalemate was largely between Republicans and Democrats. The two parties (as always) remain at odds, but the more pressing fight is now the intraparty affair between Republicans in the House and Senate. On Wednesday morning Boehner got everyone’s attentionwhen he told House members that he and McConnell hadn’t actually met in two weeks. (The pair later met that afternoon.) There are two ways to read that: The first is as evidence that this showdown is now between Boehner and McConnell as much as anyone else; the second that Boehner and McConnell are on the same page but that the House speaker needed to generate some good will from his rank-and-file by distancing himself from the Senate’s clean bill. Either way, it suggests this fight may last past Friday’s deadline.